← The Royal Family Dine Out in The Caprese! A pair of particularly perfect peppers! As promised earlier in the week, Costanzo’s Stuffed Peppers in all their colourful glory! 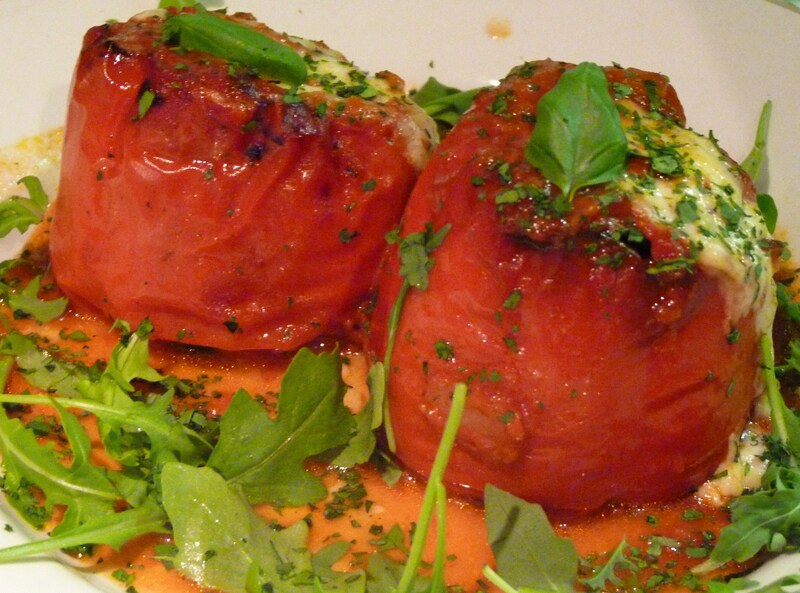 These are delicious red peppers stuffed with minced veal, parmesan and mozzarella and roasted in the oven to perfection. Finished off with fresh basil and rocket it looks and tastes delicious! Although normally served as a starter, a few of our more adventurous customers last night decided to tackle them as a main course, hence why there are two on the plate! They are very filling but they coped well with them and devoured every bit! The juices are just begging to be mopped up with our Italian bread (what Italians call a “Scarpetta”) and of course a nice glass of wine to compliment it is a must. On the subject of food (strangely enough since we are a restaurant!) we are getting more and more customers coming in with food intolerances, namely wheat and gluten which can usually cause problems when eating in an Italian restaurant! Around one person out of 100 is diagnosed with coeliac disease which means they cannot tolerate foods like pasta, bread, cakes, even beers, anything in fact that contains gluten. If you suffer from this, eating out can be very difficult as you are limited to what you can eat. Fear not, because we at the Caprese have Gluten Free pasta and rice available, just ask when you are ordering! Hope everyone had a great Bank Holiday Weekend. We had a wonderful time spent with the family in the garden since the sun decided to show its face! Costanzo took charge of the barbeque and cooked up some delicious Italian sausage and the most tender sirloin steaks ever! The wine was flowing as usual and when the bbq was finished, we retired to the other end of the garden to a giant bonfire to warm ourselves up when the sun went down. Italian music playing in the background, gin and tonics all round and a good chat around the fire rounded off a perfect day. Here’s to the next Bank Holiday, can’t wait!